Israela Margalit�s Trio - a five-year hit in Moscow! Trio is inspired by the life of Robert Schumann, Clara Schumann, and Johannes Brahms: Three musical giants who loved, admired, and nearly destroyed each other in a conflict between private passions and artistic egotism. 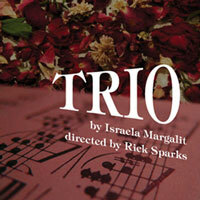 Trio was written in English. It world-premiered (in Russian) at The Soveremenick Theater in Moscow in December 2004, and became an instant hit. It performed to sold-out halls for five years in Moscow, St. Petersburg, Kiev, and throughout Russia and the Ukraine. Now in its second Russian production (with the original cast), it performs on a guest performance basis at the great Vachtanghov Theater in Moscow. "...Mercifully, Meghan Maureen McDonough, as Clara, manages a believable balance of sepia-toned history and in-the-moment emotion. Confined inside a stiff, flared, funereal dress (kudos to costumer Sharell Martin), she is a caged bird determined to fly. Her music transcends this flawed composition, however fleetingly." "...The play�s tinkering with infidelity, Robert�s oppression of his brilliant wife (forget the concert tours, dear; stay home and care for our eight children, while I sit here and bemoan my waning powers) and his subsequent descent into madness get compressed by the setting into a tendentious episode of Masterpiece Theatre. These are ideas that need to be pulled out from the play, not smashed further into it. The tinny quality of the music doesn�t help." "...Margalit's storytelling verges on the "and then we wrote" style. Director Rick Sparks has tried to soften the script, infusing it with visual glories and dexterous staging in the tiny theater. His cast reflects the dignity and physical awareness of the era but the frailties of all times. Instead of "playing" their instruments, the actors "dream" the music�engaging in air piano, air conducting, and waltzing. Indeed, several hints let us know this is probably a "dream" play, not the least of which is Clara's mourning attire throughout, as did the real-life musician in her widowhood, though here Schumann is alive but in steep decline. " "...The U.S. premier of TRIO is refined, polished, and elegant, in due to the great experience with which the production was assembled." "...Music it did serve up, but unfortunately, little else. Playwriting is a unique art form. Rarely has it succeeded as a teaching device. No matter how interesting the subject, something else besides linear facts and suppositions are demanded. Writers are always told to write about what they know, using their own experiences, grief, and joys to find the inner heart and soul of a character and give a sense of truth and depth to development and resolution. It is simply not enough to love the Schumanns and Brahms and the music they created. Somehow, one must fill the story with one�s own knowledge of insanity, thwarted creativity, and consuming drive and genius. No one knows why Schumann went insane, but the writer must know and be able to explain it at least to a certain degree.� And trite lines delivered with pride and confidence, such as "an artist must consume everything in his path� make me wince. Are there still people and tribes who purport this kind of reasoning? Revelations about Clara Schumann�her desires versus her society�was more thoroughly thought out and, thus, had greater impact than any other aspects of the play." "...And so it is with a good historical drama. Israela Margalit�s play �Trio� isn�t simply a record of the past � a past of which little is known � but a possible explanation of what happened. More than that, though, it speaks to contemporary audiences about music and marriage." "...This is a play that could perhaps only be written by a real musician � a woman who understands what it means to live the life of an artist. However, it doesn�t take an aficionado to appreciate the finished product."